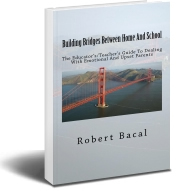 To provide educators with a sense of the importance and quality of the communication and defusing techniques they will learn from this book, below you'll find a brief synopsis of each of the book chapters. Chapter 1 begins with some quotes from teachers and school administrators who share some of their frustrations at the demands made upon them by parents. Since there's two sides to every story, you'll also see some of the common gripes parents have about interacting with school staff. Later in the chapter the importance of parents and school staff working together is highlighted, around the central reality: It takes a village to teach a child, and you'll learn why it's not only good for the children when everyone works together, but that there's a number of practical positive outcomes for school staff to be more effective with communicating with even the most difficult parents. You can't improve your communication with difficult parents without understanding where angry and emotional behavior "comes from", since the techniques in this book capitalize on the Psychology of angry and difficult behavior. In this chapter, you'll find some definitions that make the distinction between angry behavior and manipulative, and abusive behavior since they need to be dealt with differently. Chapter 3 — Why Do We Have So Much, Verbal Abuse From Adults And How Can We Use What We Know To Defuse Uncivil Behavior? We look at why verbal abuse is so commmon in adults, consider the issue of adults acting like children, and explain the origins of destructive communication patterns. We also look at the idea of "automatic scripts", since many of our techniques to stop destructive communication rely on distrupting the "tapes" that run off in people's heads. You'll also learn about the psychological needs emotional parents and community members have, when they are angry, since these are crucial in improving home-school communication. You'll learn the importance of timing and that not only does a constructive conversation depend on WHAT you say, but WHEN you say it, when emotions run high. You'll learn about the CARP system for communicating in emotional situations, plus the twelve essential principles you must use when dealing with emotionally upset or difficult parents. How can you keep your cool, and "not take" insults, or negative parental comments personally? They ARE personal, so in this chapter you will learn some techniques to use to improve your own self-control in tough and emotional situations. We go beyond the "don't take it personally" advice, and tell you HOW to not take it personally. If you start off a conversation badly, particularly with someone who's emotions are running high, it's very hard to fix the conversation. In this chapter you'll find eight tactics to use to get conversations off on the right foot, including the importance of building rapport with parents.